Bring well-salted water to the boil. The tagliatelle will only take about 3 minutes to almost cook, so once boiling start on the sauce. Melt butter with pancetta in a pan over medium-low heat, and once pancetta is cooked (not dried out), add whole sage leaves to wilt – the butter should be foaming and browning but not burning. 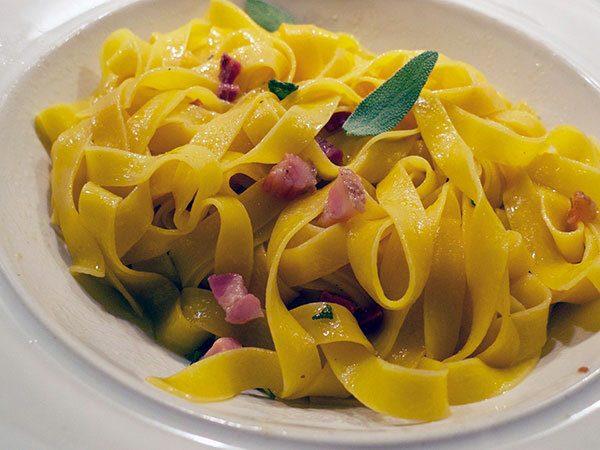 Pick the almost-cooked tagliatelle out of the water with tongs – do not drain the pasta pot – and add it to the butter sauce, along with a tablespoon or so of the pasta cooking water, and toss to combine, scraping the bottom of the pan. Garnish with torn sage leaves. Serve with lots of reggiano to grate over. Recipe via Franci. Serves 2. It’s tomato season (or the very tail-end of it), so get good ones. Slice them in half, arrange on plate with cut sides facing up, and salt well with good quality sea salt (like Maldon). Allow to sit for 30-45 minutes. 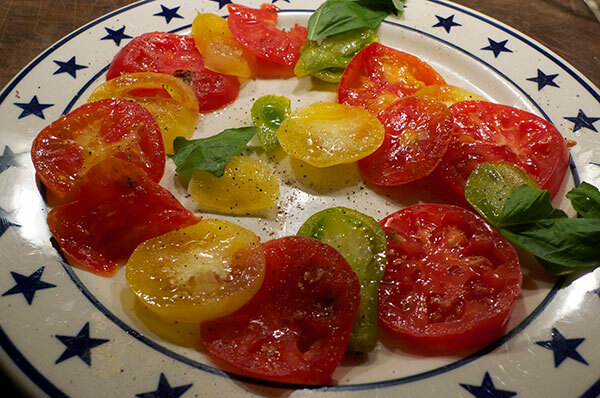 Grind fresh black pepper over the tomatoes, garnish with torn basil leaves, and drizzle olive oil over it. Serve with bread. Source good dried yellow-eye beans from a supplier such as Rancho Gordo or Purcell Mountain Farms. If you are using fresh Hatch chiles, roast them over a grill or a gas flame until skin is thoroughly charred and blistered, place in sealed ziplok bag for 10 minutes, then peel and discard skin (do not wash chiles or run water over them). Chop chiles into 1/4″ pieces or smaller. If using frozen or canned, defrost and chop. Drain the beans but reserve the cooking liquid. Put beans into an earthenware bean pot, or if you don’t have one, a heavy cooking vessel such as a Dutch oven. Cover beans with cooking liquid to one inch, and add the whole unpeeled garlic cloves, sage leaves, chopped Hatch chiles, and (carefully) the whole unpeeled tomato, stir to mix, and gradually bring to a boil over medium heat. Make sure not to burst the tomato – the acidic juice will extend the cooking time of the beans! Add another teaspoon salt, cover your cooking vessel, and put in preheated oven. Cook slowly, checking every 30-40 minutes, until beans are done to your taste. Depending on the age of the beans, this could be anywhere from 1-2 hours. When done, if necessary drain the beans, reserving the broth, and boil down the broth until concentrated, and re-add to beans. Allow beans and broth to sit at room temperature in cooking vessel for 15-30 minutes. Adjust salt and add pepper. Serve with bread or rice. This will be even better the next day. Serves 2-4. 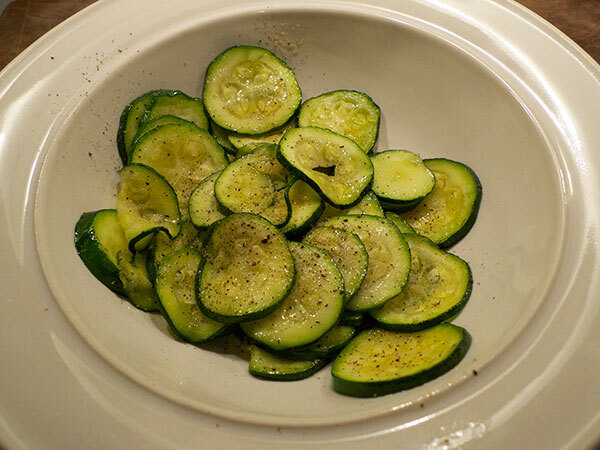 About 1-2 hours before dining, spread zucchini coins on a plate and sprinkle them with 1-2 tsp sea salt. Allow to sit. About 10 minutes before serving, drain zucchini (which will have thrown off some liquid), rinse, and thoroughly dry with paper towels. Melt butter in a skillet over medium heat. Add zucchini in one layer. Cook 1-2 minutes and turn, seasoning with freshly ground pepper. Turn again, season other side, check for salt, and serve.